Armed patriots have been seen patrolling the streets of Ferguson with assault rifles in a move described by police chiefs as 'inflammatory'. The four men identified themselves as 'Oath Keepers' as they arrived in the riot-torn Missouri city early on Tuesday morning. But the presence of the group, which describes itself as an association of current and former U.S. soldiers and police who aim to protect the U.S. Constitution, was described as 'unnecessary' amid high tensions. Armed patriots have been seen patrolling the streets of Ferguson with assault rifles in a move described by police chiefs as 'inflammatory'. The four men identified themselves as 'Oath Keepers' as they arrived in the riot-torn Missouri city early on Tuesday morning. The Southern Poverty Law Center, a non-profit civil rights organization, has described the 'Oath Keepers' as a 'fiercely anti-government, militaristic group,' and St. Louis County Police Chief Jon Belmar condemned their appearance in Ferguson. 'Their presence was both unnecessary and inflammatory,' he said, adding that police would work with county prosecutors to see if the men had broken any laws. The men were seen carrying automatic rifles and sidearms as they announced they were there to protect a media organization. Led by a man who gave his name only as John, the group, whose members wore bulletproof vests and carried sidearms in addition to combat-style rifles, said they had come to protect a journalist from the conservative 'Infowars.com' Web site. 'There were problems here, there were people who got hurt. We needed to be prepared for that,' said the man, who noted that Missouri state laws generally allow the open carrying of heavy weapons of the kind that his group were brandishing. Ferguson has seen months of violent protest since the fatal shooting of 18-year-old Michael Brown by a white police officer a year ago. GUN-TOTING VOLUNTEERS WITH THE MOTTO 'NOT ON OUR WATCH! The Oath Keepers are a pro-constitution group of former and serving soldiers, fireman and police officers with a reported membership of 35,000 - all of whom are volunteers. But critics have often accused them of vigilantism while police in Ferguson have described their presence as 'inflammatory' in what is a tense situation. The group has been courted by the Tea Party, count television personality Glenn Beck among their admirers and are deeply suspicious of the government. The Oath Keepers were founded in 2008 by former US paratrooper Stewart Rhodes, a Yale-educated lawyer and former aide to Republican Senator Ron Paul. A lengthy article in Mother Jones described the Oath Keepers as a disparate group who are united against the over policing of the American people. Sunday night's protests were punctuated by gunfire, with police shooting and critically wounding a man who they said had opened fire on them. Monday's protests were less chaotic, with about nine people arrested in skirmishes with police that saw protesters throw rocks and bottles at officers. But many in the crowd questioned the wisdom of openly carrying such heavy weapons into an emotionally charged situation. 'You're going to bring some uncommissioned citizens, white citizens, into a black community like this? It's disrespectful,' said Talal Ahmad, 30, who is black and has been a fixture of the last year's protests, which prompted a Justice Department review that found Ferguson's police department routinely violated city residents' civil rights. The appearance of the four men quickly drew stares in the mostly black neighborhood, which exploded into violence again on Sunday night. 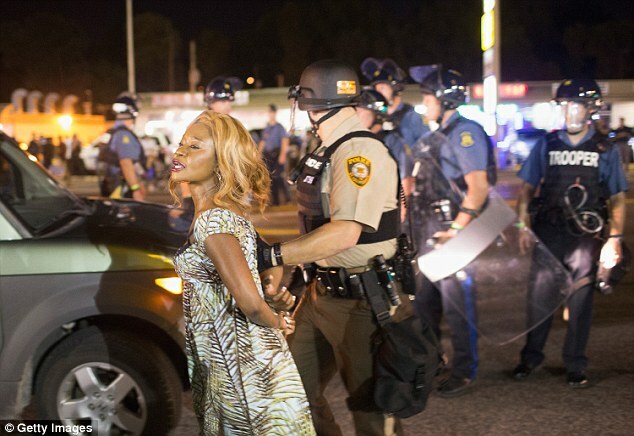 A woman is pictured being arrested during the protests. 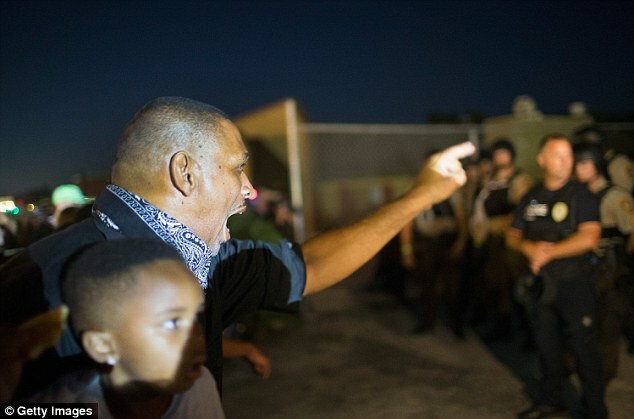 'Here, in a black neighborhood, we're already living in a state of terror,' Ahmad said. 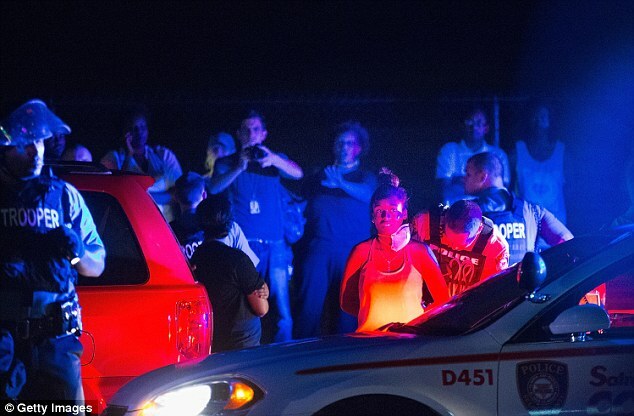 It is not the first time they have been seen in Ferguson. 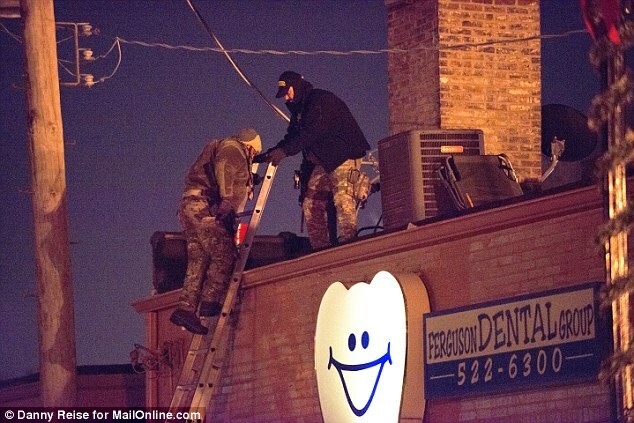 In December, the members of the militia group carried out rooftop patrols in the riot-hit city claiming they were protecting private property. The group was ordered to stand down and they eventually abandoned their posts after being threatened with arrest.